This entry was commended for its simplicity, it’s use of colour, and the sense of fun. As always, Pascal’s presentation of the build was top notch. 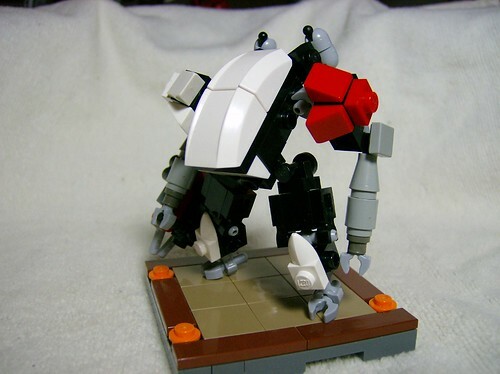 The judges considered this an exceptional build. The tiny piece of insulating tape on the head was a great finishing touch. And again, the presentation was first class. Rated highly by all the judges, the McCoy was found to be interesting, imaginative, and well designed. The frame was relatively simple, but made good use of colour to indicate what the purpose of the design was. The ‘jaws of life’ attachment was a fun and appropriate addition to the overall build. 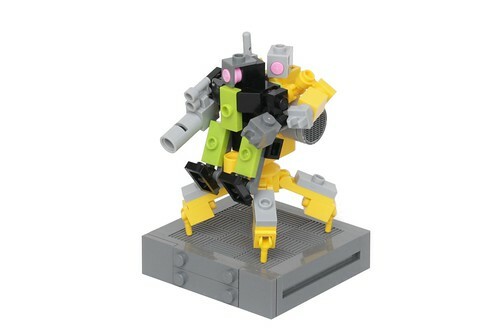 So, well done to XGundam05 for winning the first ever MFZ contest. I’ll be in touch shortly to sort of the prize. The judges would also like to highlight some frames that didn’t make it into the top three, but that were felt worthy of a special mention. Joshua said: “The Recovery Frame helicopter by Onosendai2600 is an amazing combination of animal shapes and a Chinook chopper that work really well together. While I’d like to see it scaled up just slightly, the cramped cockpit has a certain charm. Let’s just say there was considerable discussion amongst the judges regarding what was and was not a support frame. In the end the POV that recon should be excluded was discarded. However, some chose to express their opinion on this matter through their scoring. 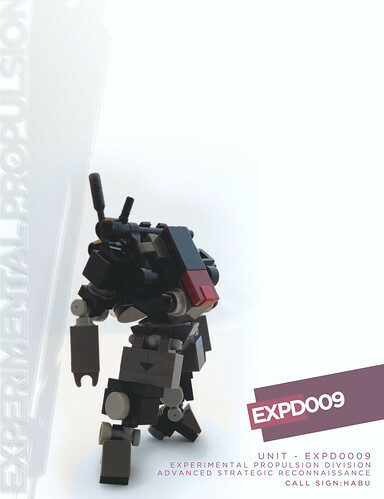 Rumored to be a myth and developed in secret by the 256Omincorp’s Experimental Propulsion Division, The EXPD-000 series of mobile frame represents the highest innovation in interstellar travel. Utilizing the Fleischmann and Pons Gravity Fold Micro-Reactor the EXPD 0009 is capable of instant transportation over massive distances without the use of a transit gate. The incredible amount of energy required limits the EXPD 0009 in its ability to make multiple jumps, and the collateral damage involved means she is currently confined to jumps within low orbit. The extensive calculations and low operator survival rate requires on-board AI assistance and can be deployed unmanned with limited capabilities if necessary. Outfitted with a subspace communications array, and zeta-pixel optics, the EXPD can communicate with its point of origin and transmit large information packets with limited loss. Should the AI or frame itself suffer catastrophic failure, the reactor and propulsion system can and be commanded to return remotely. Extremely expensive, dangerous to operate, and constant maintenance of the delicate and complicated systems mean the EXPD 0009 will never see mass production. However the appeal of circumventing the Terran Transit Authority has made this frame sought after by various factions. 256Omnicorp’s official position remains that this frame simply does not exist: coincidentally, the rising reports from various sources of hijacked satellites, strange low-orbital phenomenon, and the locations and capabilities of competing classified tech being broadcast publicly points towards corporate espionage and sabotage – casting a shadow on 256Omnicorps already less than sterling reputation. Thanks- it’s good to see the 0009 isn’t just for show. A Frame that can Transit itself would indeed have great strategic value and take reconaissance to a whole ‘nother level. Grats to everyone on this really fun contest. I hope to see more like this in the future. The reaction seemed overwhelmingly positive. Also, I’m happy I made an honorable mention! It does seem the link to my LUGgernaut is broken, however. Grats to XGundam05! Great choices! This was a really fun contest, and frankly I couldn’t be happier to just get an honourable mention! Thanks for a good time. I’m ready for the next challenge. It was an awesome contest. All of the entries were very impressive. The winner does look like something I would expect to see in the book. Glad to be an honorable mention. I did pick up a small bucket of transparent bricks from the Lego store shortly before the contest. LOL. Looking forward to future contests like this! Thanks for a great contest! I’m floored that I made 3rd place given all those awesome entries. Congratulations to the king of the hill!